Whether you have a motor home, a truck camper, or a travel trailer, you may need to find a way to store it during the off-season. 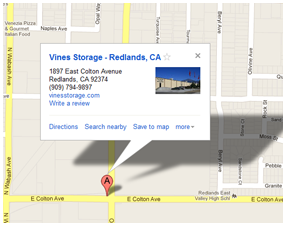 If you are considering somewhere to protect your investment, consider Vines Storage in Redlands. Motor home storage is one of our available options for those who need to find off-site storage for long term or short-term needs. No matter what type of recreational vehicle you need to store, Vines Storage can help! If you've been storing your RV in your driveway, you may find that it is a considerable inconvenience and takes up an extremely large amount of space. It can block your view when pulling your everyday vehicle out of the garage and driveway, which is a hazard for both you and other drivers. Storing your motor home off-site is a great way to free up space at your home. With indoor motor home storage, individuals can be assured that their RV is not outside in the elements taking a beating by the sun, rain, hail, and snow. Storage facilities such as Vines Storage offer both indoor and outdoor RV storage, so you can determine which is best for you and your vehicle. Additionally, Vines Storage offers video surveillance to protect and monitor your RV. By storing your motor home in a facility such as Vines Storage, you will be able to ensure that it is maintained well during this time. You can come to Vines Storage to clean and maintain the vehicle between trips to campsites, and know that the weather and elements won't be affecting it and causing damage to the motor home. Most anyone can benefit from motor home storage facilities in the Redlands. It can help protect your RV and ensure it has a long lifespan you can enjoy for years to come! Looking for indoor or outdoor RV and motor home storage? Call Vines Storage today to learn about our facility, storage units, and flexible leasing options.